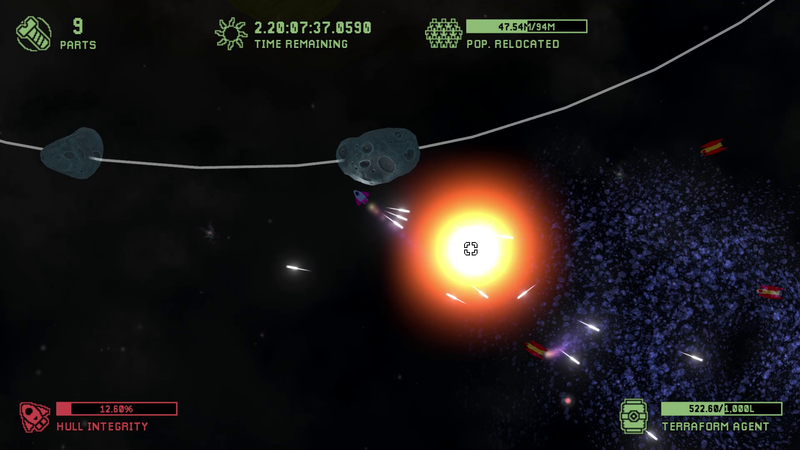 Cosmic Ray features casual gameplay and short rounds, making it a great option for killing a few minutes. 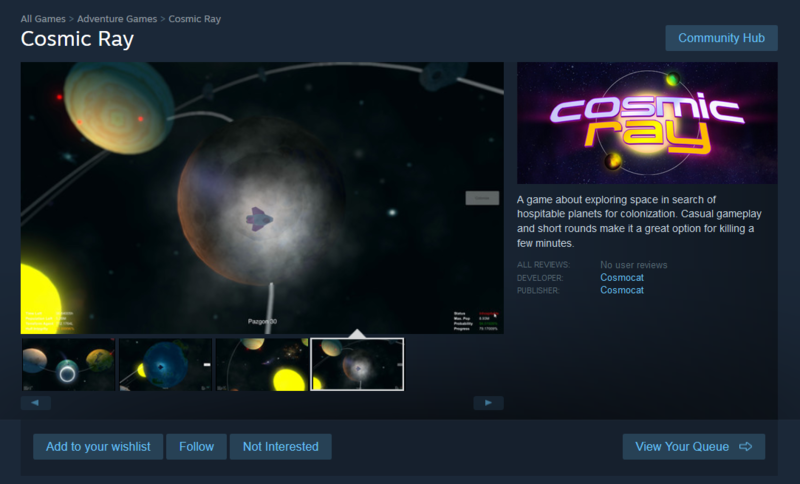 A bit of back story: Cosmic Ray originally started off as a prototype about a year ago. Just something I jammed out with an artist in about a week. 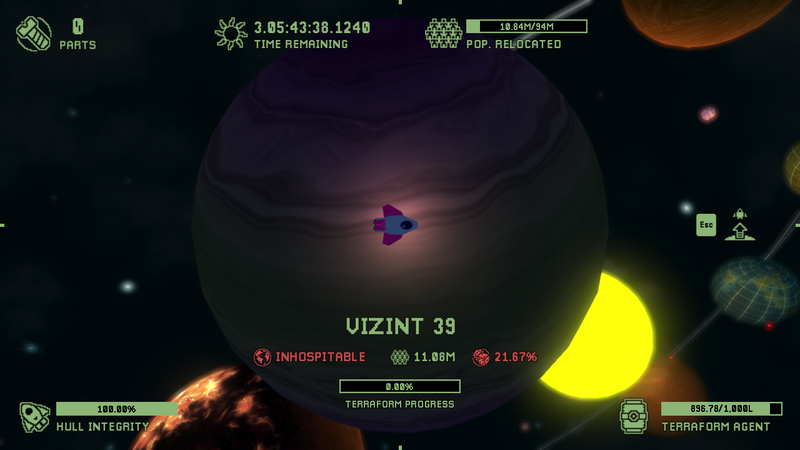 We released a WebGL build on Itch, where's it's more or less just been stagnating since then. I recently came to realize, however, that the project I've been working on for the past couple years (Undermine) is too ambitious--bigger in scope than I have the resources (time and/or money) to enable releasing in a reasonable timeframe. My last game took ~3 years to release, and I'm on track to exceed this with Undermine. 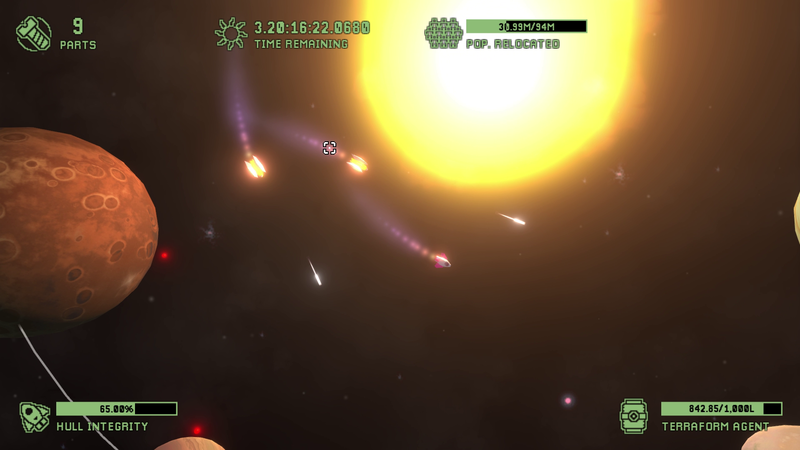 So the thinking is to pause the big game for a bit and capitalize on work I've already done, focusing on releasing smaller games quickly and starting to build up a backlog catalog. The hope is this will start generating more recurring revenue, which I can then use to fund Undermine and bigger projects down the road. 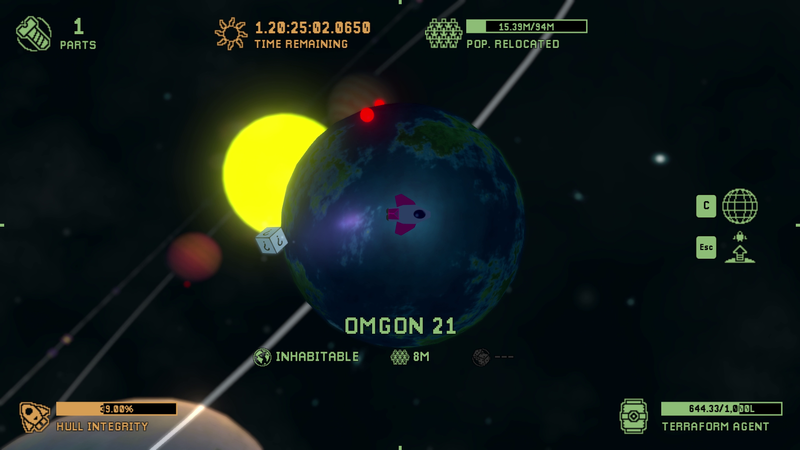 The basic mechanic when terraforming and/or searching a planet revolves (no pun intended) around orbiting the planet. Because of this, it's often not possible to see what's on the back-side from the "solar system" view, which encourages exploration. 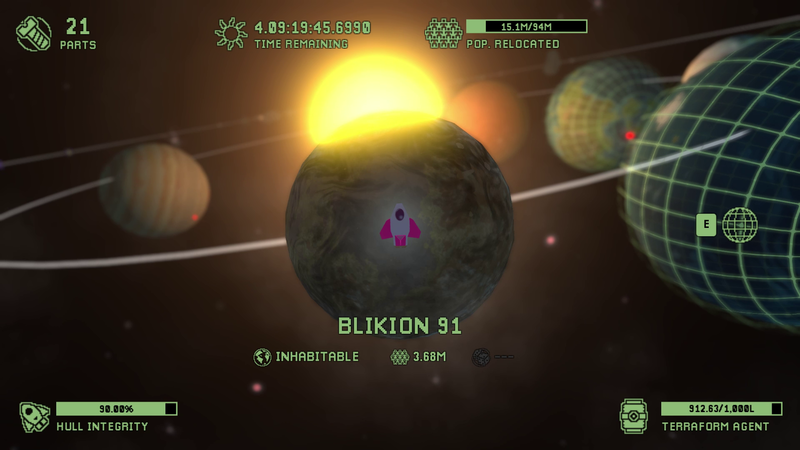 (this is where I'll be hiding the alien artifacts, naturally) Many elements of a round are also randomized, including planets (name, size, texture, the probability of terraforming) and enemy placement. 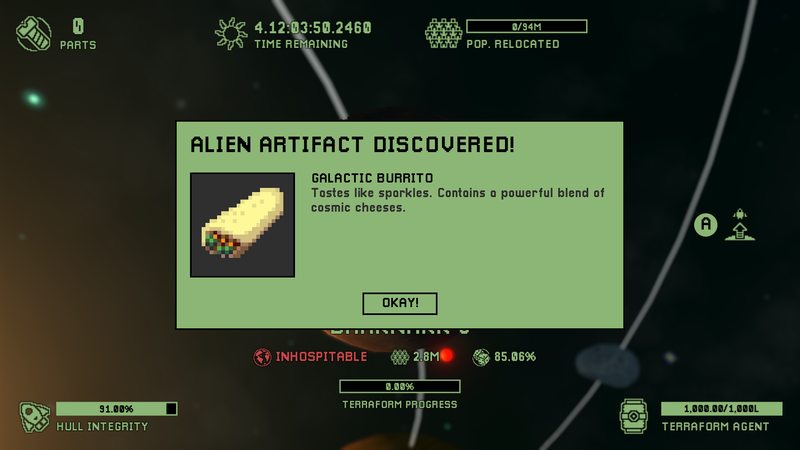 alien artifacts: each with their own sprite representation and back-story. Only a limited number spawned per round. message from Earth: displayed at key intervals/events (intro, 1 day remaining, victory, fail, etc.). 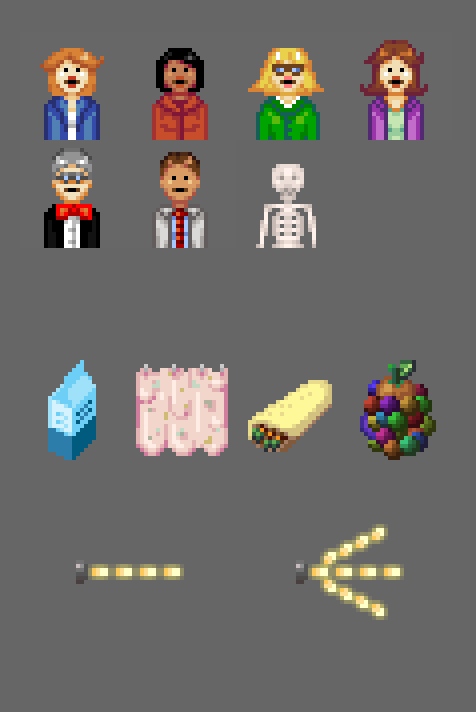 Each will have a little sprite representation of the character, and some silly random stuff for comedic value. 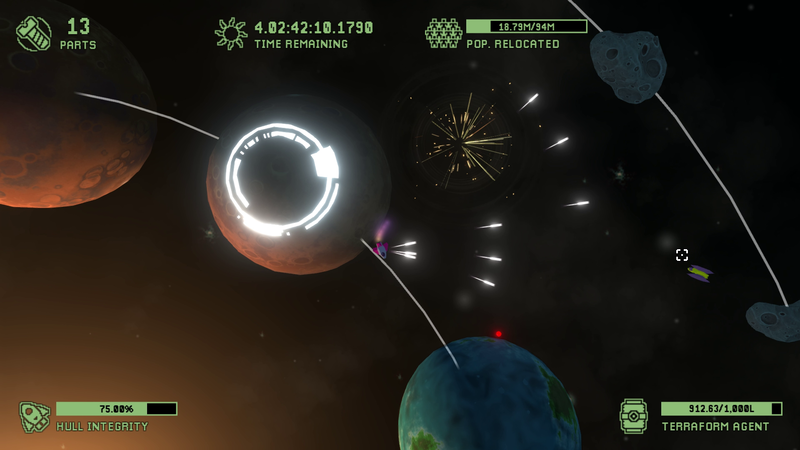 My plan is to undertake a fairly aggressive timeline, I'm thinking 2-3 weeks to release an initial version on Steam. I'll try my best to report my progress here regularly. 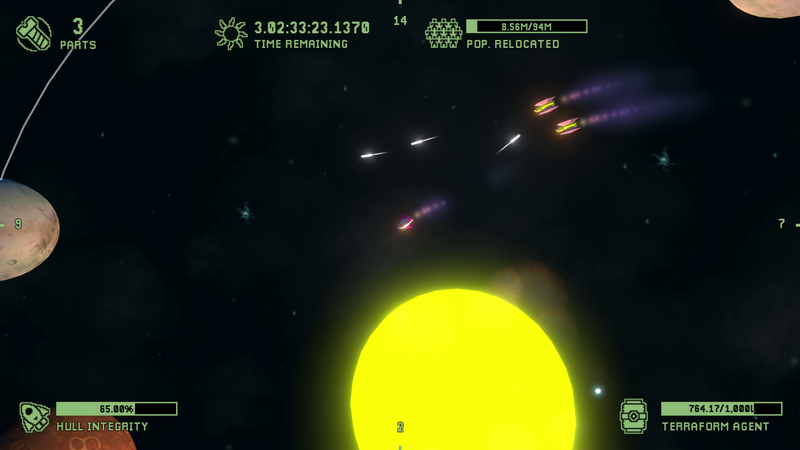 I just need one more screenshot and a trailer and then I can send it off for approval. 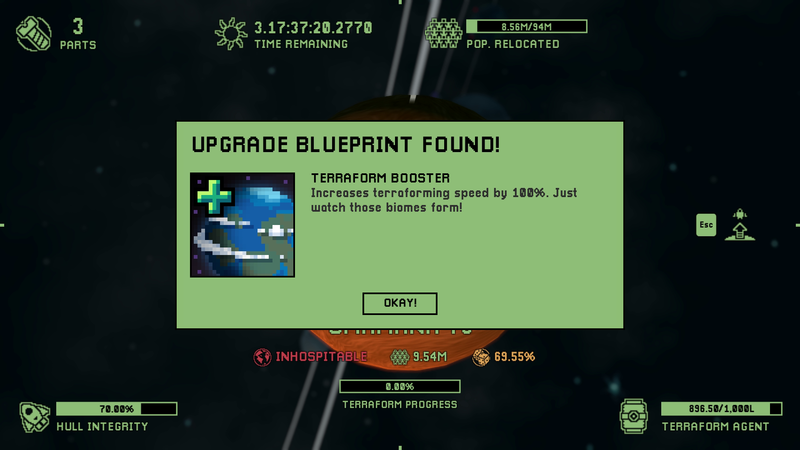 I'll be using pixel art in places to keep costs down, although what you see in these shots is more or less placeholder. 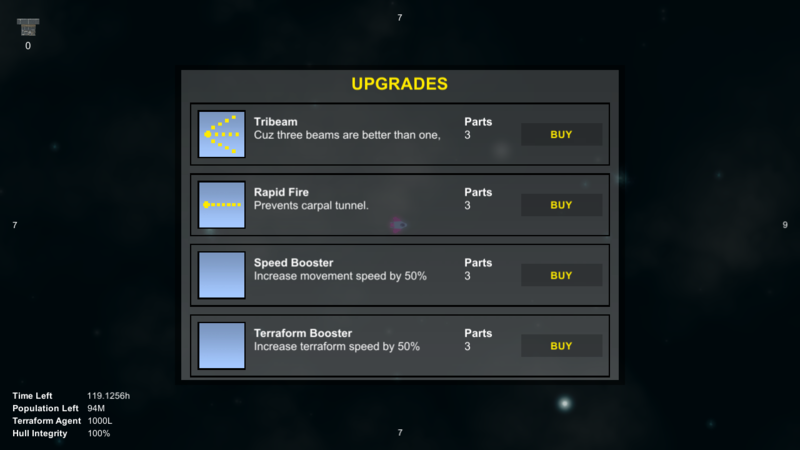 I'm still deciding on what the remaining upgrades will be, but probably some combination of speed boost, terraform boost, and/or shield. As you can see, we're going for something kind of retro. 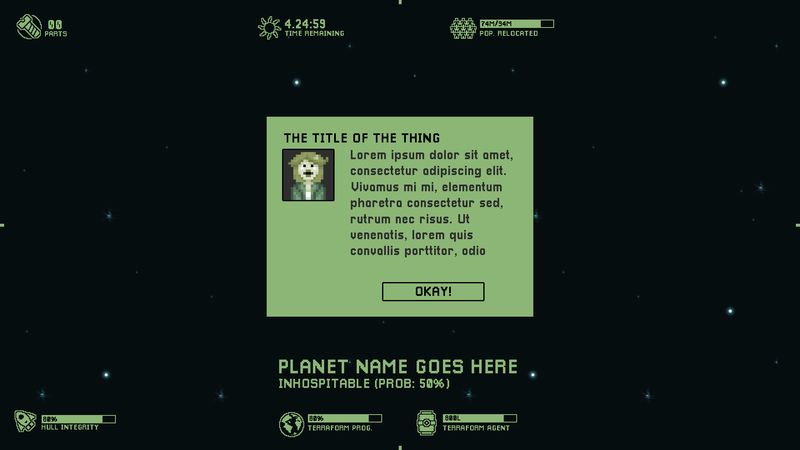 The theme is "80s space program", although as it is now it looks a touch Gameboy-ish because of all the green. The full version will have a few diff colours. On the marketing front, the Steam store page has been approved. Now I just need to get things looking good so I can put the store page up as "coming soon". As a result, I'll probably shift my focus to visuals until I'm able to capture some shots and footage that I'm happy with. 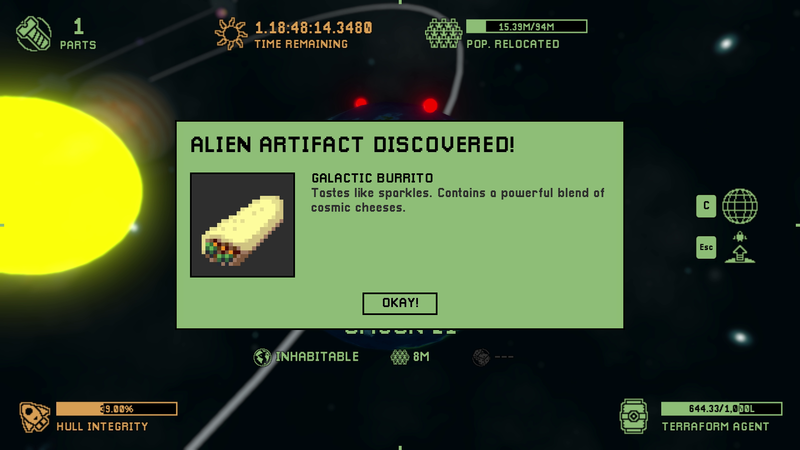 We'll probably need to re-touch the more detailed pixel art pieces for cohesion. I'm going to start by applying a green-ish tint, as pictured in the mock-up above. 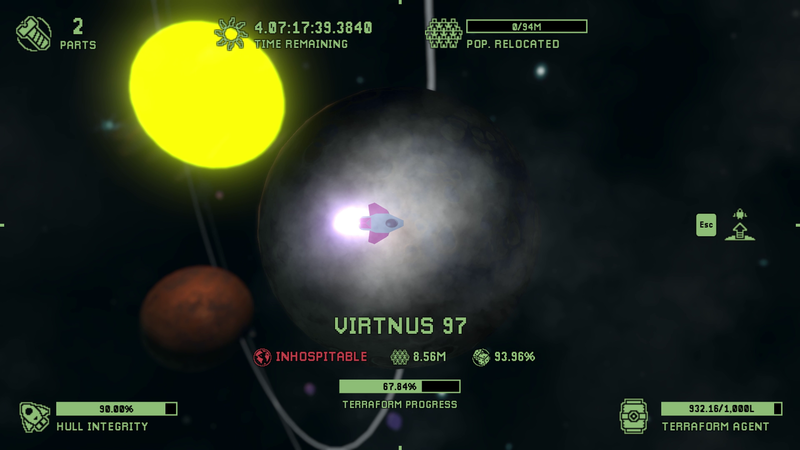 Integration of the new UI/HUD came together pretty quickly, just about done! 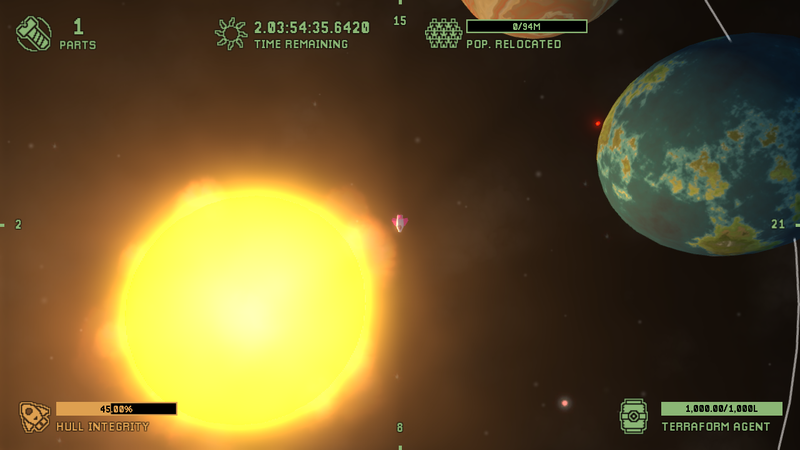 It reminds me of a game I used to play a lot called Solar Winds. Was actually thinking about making a game myself in that style! What are you using to program/build it? What are you using to program/build it? Cool thanks! I've been playing it on the website. 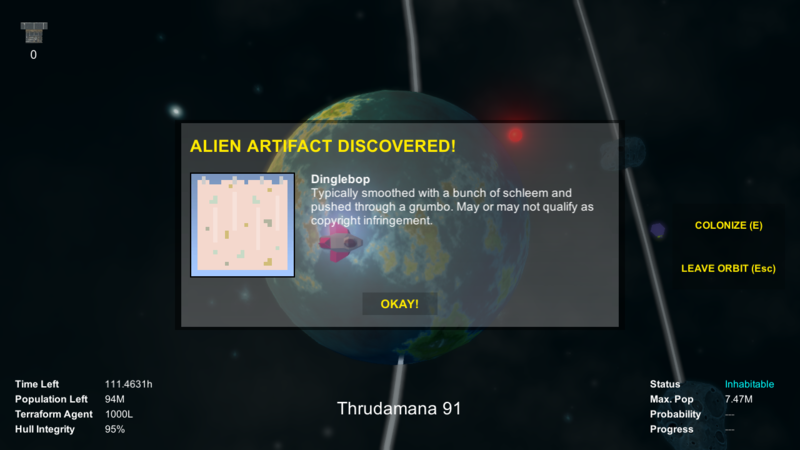 Cool game! Very nice music too. I put the Steam store page live today (as "Coming soon"), which means a new batch of shots along with a quasi-trailer (it doesn't showcase quite as much as I'd like, but I wanted to get something live sooner than later so I can start ramping up the marketing efforts). Other than that, I'm plugging away at adding some tutorial-ish stuff, like showing what keys do what on the first playthrough. I also put together a registration form for the upcoming closed beta, and submitted the beta to Betabound. I had a pretty decent response for the last beta I listed with them. 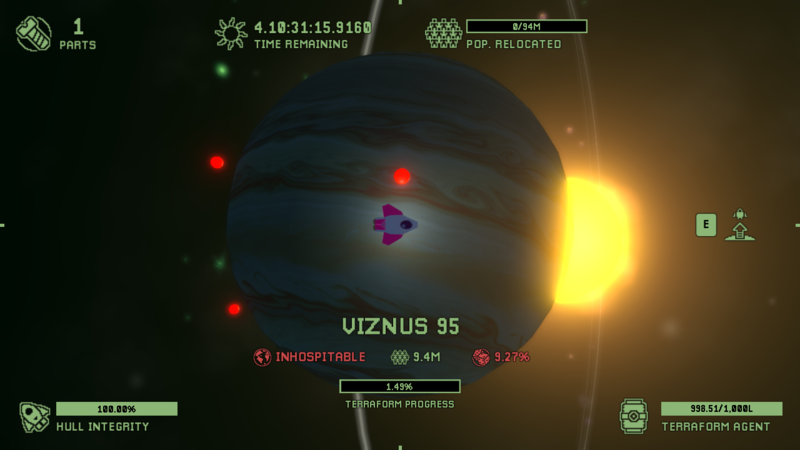 doubling the length of a round: 1 game day now = 2 real minutes (was 1), and everything else was scaled accordingly (number of solar systems, terraform agent usage, etc.). I want there to be enough tension created over the course of a round, I don't want it to feel like too short of an experience, and my hope is to create something that requires at least a few tries to beat... tough balance to strike! 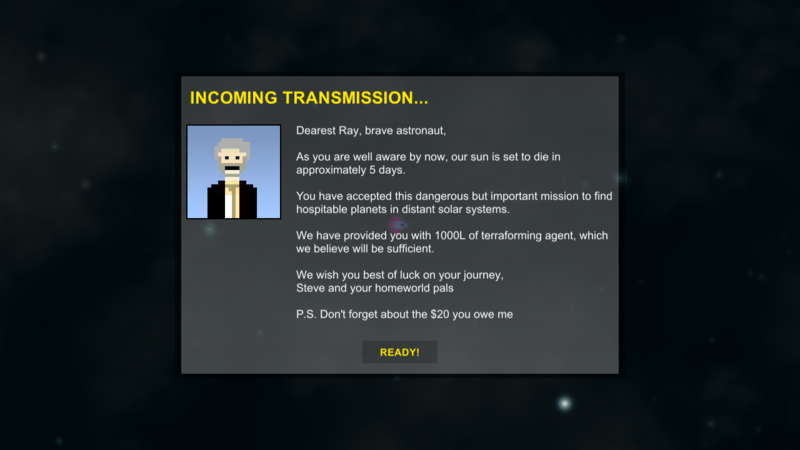 controlling the solar systems a bit better: I now ensure there's a minimum number of planets, a limited number of "easy" planets (immediately inhabitable), etc. alongside the above I also introduced another element to add some variation (and more difficulty towards the end): black holes (GIF below). 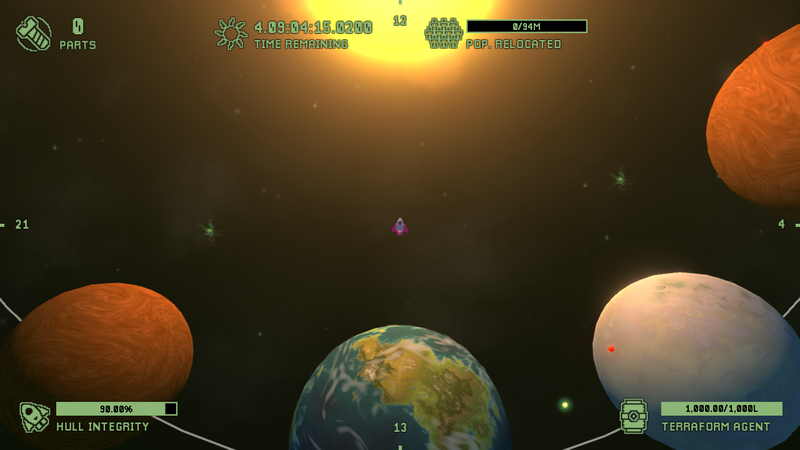 They appear halfway through the game, surrounding the solar systems. They one-shot the player, but are pretty easy to avoid. 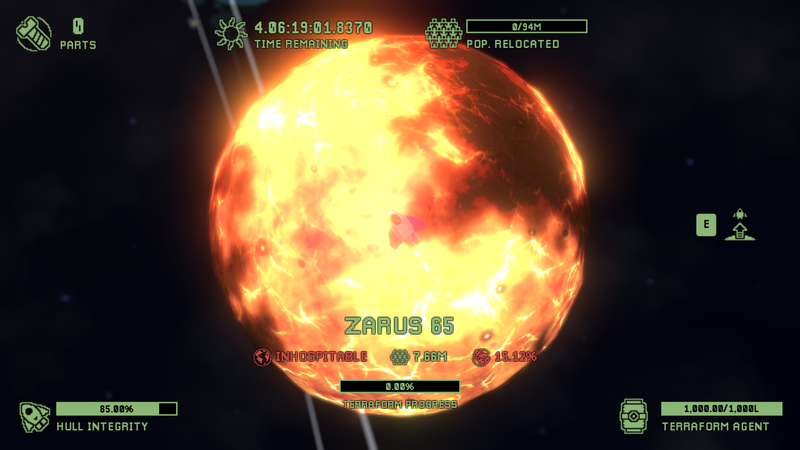 polish stuff, like adding some particle effects and SFX on terraform success, adding some more interest to the orbit marker (GIF below), etc.